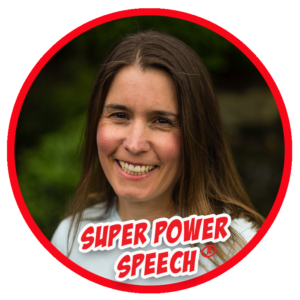 Super Power Speech is a blog to emPOWER speech pathologists and educators with ideas, materials, and inspiration in their professional and personal lives. I began Super Power Speech in 2008 as a blog to connect with parents and speech pathologists, making this blog one of the longest running blogs for SLPs in the world! Here you’ll find hundreds of posts of speech ideas and inspiration. I have also developed popular materials for speech pathologists and educators in my Teachers Pay Teachers store. To educate speech pathologists on current therapy topics. To make the lives of educators easier by creating high quality materials to use in the classroom. To provide easy to follow lesson plans to help speech pathologists with organization. To engage other book lovers in fun and meaningful book discussions. To track my journey through this decade of life. Are you ready to hone your own super powers? Join 16,000+ other email subscribers in getting freebies, tips, and engagement in a super community! Jump on in and subscribe to Super Power Speech! Let’s develop our super powers together! Click here for disclaimers, privacy, and legal information.